UD’s lifelong learning programs enrich adults’ lives. For kids, fall means “back to school.” For many people of retirement age in Delaware and the region, the season still brings the same anticipation of the start of the school year. Students at the Osher Lifelong Learning Institute at the University of Delaware don’t have to fret about exams and grades, though. They are learning for the fun of it. The Osher Lifelong Learning Institute is a membership organization for adults 50 and over to take classes, teach, exchange ideas, and enjoy time together. Instructors teach subjects they love to students who are there for the love of learning. Osher Lifelong Learning programs are located at Arsht Hall on the UD Wilmington Campus at 2700 Pennsylvania Avenue; at the Modern Maturity Center, 1121 Forrest Avenue in Dover; at the Lewes School, 820 Savannah Road in Lewes; and beginning in fall, in Bethany Beach. 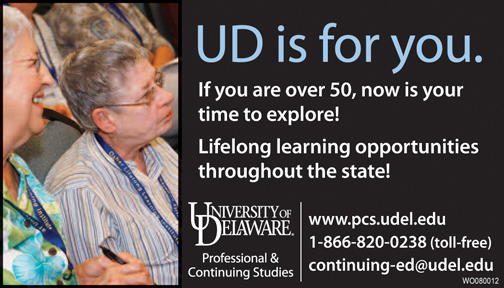 An amazing variety of courses are offered through Osher Lifelong Learning at UD. The list varies with each location. Students take courses in art, history, literature, health, computers, yoga, philosophy, memoir writing, music, languages, genealogy, and much more. For further information, please visit www.lifelonglearning.udel.edu or call toll-free 1-866-820-0238.